A comprehensive study of all the homes for sale in Tallahassee has revealed a fresh new trend. There is something very different about today's home sellers than those in recent years, and buyers must be aware of this trend if they want to procure the best deals possible. 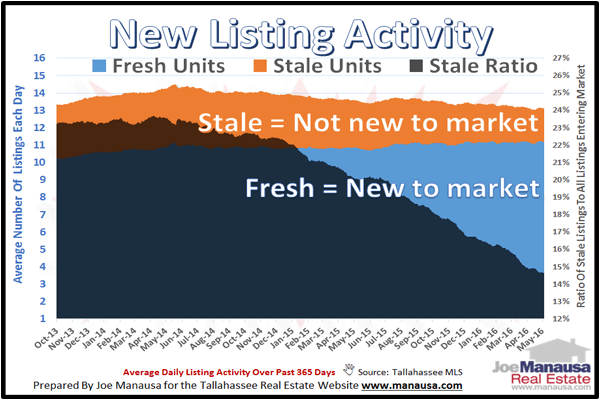 In order for us to study all the listings in the Tallahassee MLS, we first have to do a lot of data scrubbing so that we can compares "apples to apples." Just because a property appears to be new to the market, the fact is that many are just "re-listed" after they have been listed for a while. If we were to try to pull a "what's new" report directly from the Tallahassee MLS, it would be grossly inaccurate and it portray a situation very different than what is truly occurring. So we download all the listings, many times per month, and track their origination date and their termination date and cause. For the purpose of our first real estate graph, we have categorized all of the active listings in the MLS into one of two groups. Stale - These are homes that have been on the market within the past few years and failed to sell at that time. Thus the current listing is not really "new," rather it is just relisted. Fresh - These are homes for sale in the Tallahassee MLS that have not been listed for sale prior to the current listing (going back to 9/1/2012). Thus, "new" listings are either "Fresh" or "Stale," and this is based upon whether or not the current owners previously tried to sell their home. In the graph above, fresh new listings are shown in blue, while stale new listings are stacked on top in orange. The average number of listings each day is shown on the left vertical axis, while the ratio of stale listings to all listings entering the market is shown in black and recorded on the right vertical axis. The exciting trend that is shown in the dark declining area is that stale listings have gone from roughly 1 in every 4 in 2013 to just 1 in every 7 today. This means that buyers are seeing fresher inventory than at any time going back to 2006. One might think that because the market is on fire that all home sellers are getting buyers for their homes. In fact, 1 in every 5 home sellers is failing to sell their home. If we were to only look at initial listing periods, the failure rate would be even higher. Needless to say, most of the "blue" current listings have entered the market in the past few months. 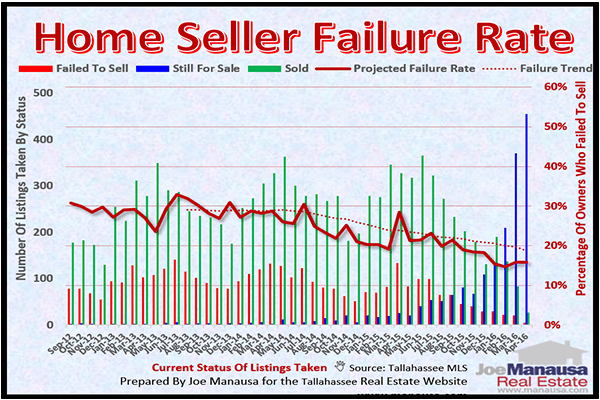 The following map and list of homes are ones that have been listed within the past 7 days in the Tallahassee MLS. It does include homes that have been "re-listed" during that period as well. I hope you learned something from today's report on homes for sale in Tallahassee. If you have any question that were not addressed in this report, simple CLICK HERE to contact me with additional questions or insights gained from today's report.